The world is ending. Humanity’s final judgment is at hand, and the only hope for us is in the harbingers of our destruction: The Four Horsemen of the Apocalypse. 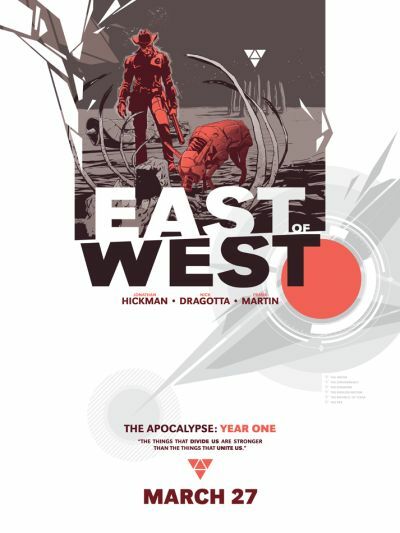 This March, the new Image Comics series EAST OF WEST, a dystopian western by Jonathan Hickman and Nick Dragotta, will cast readers into a broken future where the world’s most powerful men and women are working together to manufacture the end of the Earth. The Four Horseman aren’t exactly Biblical - Hickman describes them as “scary adolescents,” and their goal is to take a series of actions that will eventually domino into apocalypse. In the face of this, the question of who will stand against them is one of the many mysteries and shocking revelations of EAST OF WEST. Hickman’s collaborator, artist Dragotta, whom Hickman calls “Probably the most expressive artist I’ve had the pleasure of working with,” has also worked with him on Marvel’s Fantastic Four and FF. His intricate pages capture dusty wastelands and cramped cityscapes, as well as the varied inhabitants of EAST OF WEST’s apocalyptic world. 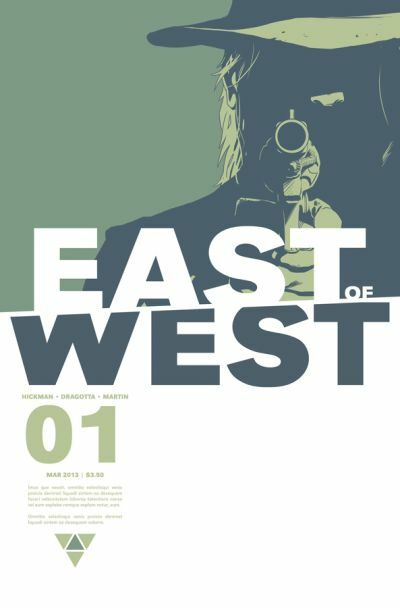 EAST OF WEST is a full-color, ongoing series starting on March 27, 2013. Issue #1 (JAN130468) and #2 (FEB130440) are available for pre-order now in the January issue of Previews. A promotional poster will arrive in comic book stores on February 27.